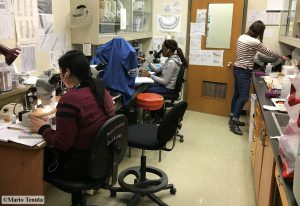 The Applied Soil Ecology Lab has highly productive and impactful research programs with several important agricultural foci: soil ecology, nematology, and the relationship between nutrient management and greenhouse gas emissions. 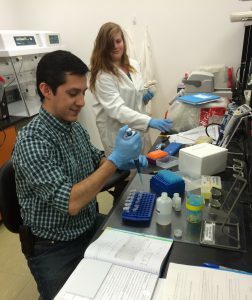 Research projects are carried out under the leadership of Mario by our graduate students and expert technicians, with the help of undergraduate summer research students. Our research programs benefit from collaborations with many individuals from the academic community, industry, and government. Summary: Fertilizer nitrogen (N) is one of the greatest operational cost to producing canola. Fertilizer N results in almost miraculous production increases but it also has the down side of producing the greenhouse gases, nitrous oxide (N2O) and ammonia (NH3). The Prairies are reliant upon continued increases in the export of canola grain, but to be sustainable, reduction in N losses and more efficient use of fertilizer N is required. Growers are faced with practical challenges of applying fertilizer N in the fall, though they know it is not the best means of using N. They are uncertain if newly available enhanced efficiency fertilizer products, that carry a price premium, are worth purchasing. Many growers faced with tight schedules for planting are opting to shallow band or even surface place fertilizer N though these are not current recommended practices. Some growers are experimenting with in-season fertilizer N application but don’t know if it worth the extra management consideration or what rates, application method and fertilizer source to use. The current project attempts to help address these outstanding grower issues. It builds upon previous work using 4R Nutrient Management to optimize the rate, source, placement and timing of granular urea addition to canola for improved profitability and reduced greenhouse gas emissions. Specifically, through six field trials on commercial fields, the project will examine direct emissions of N2O in relation to benefit of incomplete factorial treatments of granular for placement (surface, shallow and deep banded), inhibitors (urease, nitrification and both), and timing (fall, spring, mid-season). Summary: The project advances on previous work done by our team and others on the agronomic and environmental benefit of 4R Nitrogen Management practices on corn production across Canada. Field studies will be used to determine: A) if advanced 4R N management for Quebec, Ontario and Manitoba conditions changes the most economical rate of nitrogen and improves grower return on investment? B) if advanced 4R N management for Quebec, Ontario and Manitoba conditions reduces N losses to the environment? C) if a novel practice of single vs double injection bands in combination with depth placement and N source reduce N losses and increase corn grain yield in Ontario? and D) advancing grower tools for in-season nitrogen rate determination. 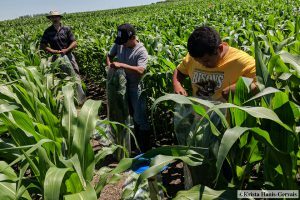 Can Cover Crops Reduce Nitrous Oxide Emissions from Agricultural Soils? Summary: As part of the Applied Soil Ecology Lab’s research to changing how food is produced to be a net non-emitter of GHGs from soil, this Discovery Grant program grant focuses on answering the following questions: A) do covers reduce or increase thaw N2O emissions following alfalfa plough-down in organic production?, B) do covers reduce or increase thaw emissions in conventional production?, C) can covers lower nitrate and soil moisture to limit thaw emissions?, E) how do microbial genes producing N2O relate to thaw emissions and effects of covers, management, and soil conditions?, and F) can the widely used simulation model, DNDC, predict cover effects on emissions? Summary: This project aims to resolve significant gaps in understanding N2O emissions from the increasingly popular practice of cover cropping. Past studies focused on warmer climates where thaw emissions are less important. On the Prairies and in Eastern Canada, thaw can contribute to 20-50% of emissions for conventional systems and, as we recently discovered, > 80% of emissions for organic systems. 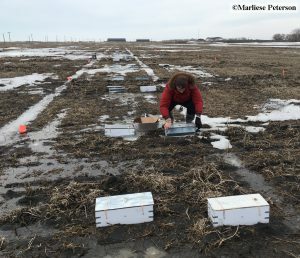 The studies here will discover if covers cause reduced thaw emissions by lowering soil NO3– and will determine how low levels need to be to limit emissions. Alternatively, covers may increase C availability to denitrifiers increasing emissions at thaw, particularly with termination before planting. We will learn how soil moisture determines relative N2O and N2 emissions to increased C availability and lower NO3– with covers. Knowing how covers affect soil emissions allows for better forecasting of the national GHG inventory. 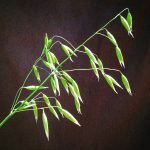 The research will also help in reducing the environmental footprint (N2O and CO2 emissions) of oat production in the Red River Valley, an area that General Mills sources most of the oats for its products. 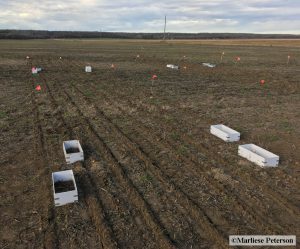 Summary: This project will evaluate cover crops in annual rotations in Alberta, Saskatchewan and Manitoba over a four-year period. The objectives of the project are to: A) quantify the potential for cover crop growth across a range of cover crop windows and growing environments, B) evaluate the reliability of cover crop establishment within annual crop rotations across a range of growing environments, C) evaluate the impact of cover crops in crop rotations on crop yield and quality across a range of growing environments, D) evaluate the impact of cover crops on soil health across a range of growing environments, E) quantify the environmental impact of cover crops on N2O fluxes in three growing environments, and F) evaluate the economic costs and benefits to including cover crops in annual rotations across growing environments in Prairie Canada. Summary: The impact of changes in management on greenhouse gas (GHG) emissions is not always clear due to the complexity of cattle production systems. Systems-based, whole farm analyses are necessary to address these complex issues to ensure that policy development and consumer information is founded on the basis of sound science. This project will provide new science-based knowledge regarding net GHG (CH4 and N2O) emissions related to dietary and manure management practices, and their integration in beef cow-calf operations. Improved scientific understanding of GHG transfer in agricultural systems will lead to identification of Best Management Practices that can be targeted for policy development and program delivery, in order to improve economic and environmental sustainability of the Canadian cattle industry. 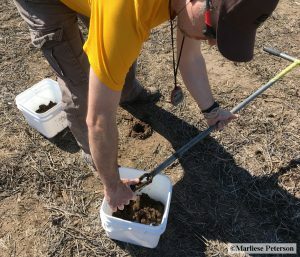 Dr. Tenuta’s role in this project is to determine if stockpiled solid manure from feedlot fed cattle consuming different diets designed to reduce enteric CH4 emissions affects direct N2O and indirect (NH3) emissions as well as CH4. 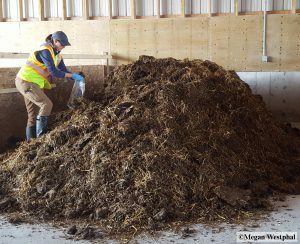 As an additional treatment, manure from 4 test diets will have more straw bedding added to test if augmentation of organic carbon during stockpiling reduces GHG emissions. The manure after stockpiling and monitoring will be incorporated into soil and the direct emissions of N2O will be monitored. View more photos of this research program. Summary: This project will: A) establish the current production efficiency and environmental footprint of producing pigs in Canada, B) determine changes in production practices over the past 10-12 years, and C) identify improvements in the environmental footprint of pig farming in Canada, through comparison of current pig farming in Canada to an earlier period (e.g. 30 years ago). It involves conducting a literature review to establish the current state of knowledge pertaining to environmental footprint indicators of pig production, a management practices survey of commercial pig production facilities across Canada, on-farm case-studies to augment or validate survey findings, and conduct a life cycle assessment (LCA) to identify the types of operations and management practices that have a more favourable footprint. Summary: This project continues the proactive role the University of Manitoba and MPSG have played in knowing when SCN arrived in the Province, offering outreach activities to inform growers about SCN and developing capacity within the Province for future surveys and research to mitigate SCN damage. This project includes a survey of 25 soybean fields, as well as the fields of a seed potato grower in North Cypress. Each field will be sectioned into areas prone for the establishment of SCN. Areas will be sampled to 12” with 10 to 25 sub-samples taken for each, depending on section area. Soil from each area will be air-dried and 2.5 lbs will be extracted using a cyst extractor. Extracted cysts will be isolated from soil debris by flotation in ethanol. They will then be screened for belonging to the genus Heterodera based on vulval cone structure and being lemon-shaped cysts. The cysts of Heterodera will then be sorted if being SCN using identification keys. Suspect SCN cysts will then be confirmed using PCR methods. Only samples being positive by morphological and molecular examination will be considered to be SCN. Positive fields will be resampled. We propose to develop an accurate and quick molecular method by skipping the most laborious steps (crushing and counting) and then manual SCN identification. Instead we propose a genomic DNA extraction of isolated cysts with quantification using the CoxII gene and real time PCR. Twenty soils from Ontario ranging from none to extremely high cyst levels will be used to optimize a cyst extraction and PCR protocol as well as calibrate the real time PCR method. Summary: This project aims to improve understanding regarding plant nematodes to prevent new market access issues and prevent issues of disease in pulse crops on the Prairies. The project seeks to: A) understand the pulse host crops and yield losses due to the root lesion nematode, P. neglectus, found on the Prairies, B) understand host rotation crops for the root lesion nematode, C) recommend rotations to limit yield losses in pulses due to the root lesion nematode, D) create awareness for scouting and sampling for the root lesion nematode and other nematodes to manage the pests, E) inform garlic growers of phytosanitary practices to limit risk of spreading the market access nematode, D. dipsaci, to yellow pea fields, F) to determine why high temperatures allow the stem nematode of the weed Canada thistle, D. weischeri, to reproduce on yellow pea, and G) screen important crops grown in India to D. weischeri under temperature conditions reflective of that country. 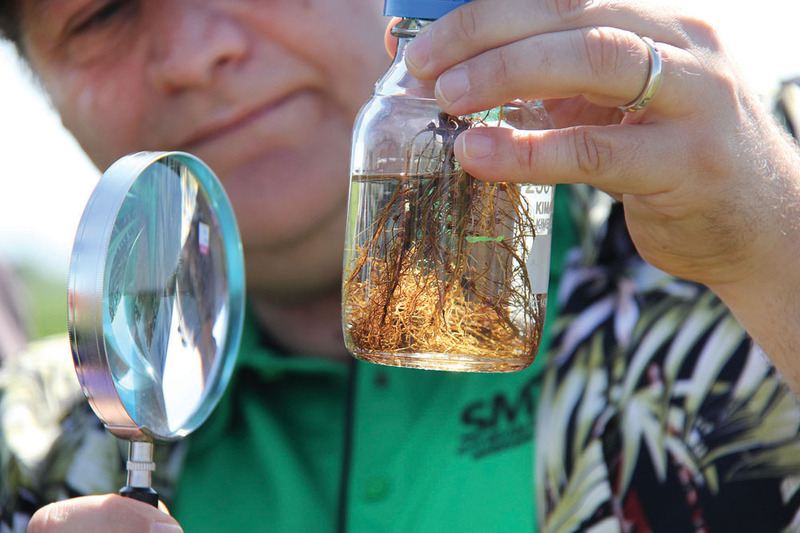 Dr. Mario Tenuta inspecting a soybean cyst at the Manitoba Pulse & Soybean Growers SMART Day, 2015.